Since the classic synth has made a resurgence, the entry of low-cost remakes was pretty much a given. And no brand is perhaps more associated with cut-rate gear than Behringer. So, while the 12-voice Behringer DeepMind 12 has only just arrived on the market, the company is already teasing some kind of sub-$100 synth line a well as the $400-ish (proposed) BEHRINGER D. It’s a clone of the original 1970 Minimoog Model D, in a desktop case (no keyboard). There’s nothing here that diverges much from the original Minimoog. The main thing is, this adds MIDI and the ability to bolt the synth into a Eurorack case. In what is apparently an emotional defensive reaction to the electronic musician community’s emphasis on originality and authenticity, Uli goes into everything from open source hardware, Tesla, manufacturing expenses, the number of engineers Behringer/MUSIC Group employ, and how the idea for going to Eurorack came from someone on a forum. The open source rant is a little puzzling, as there seems no implication that Behringer are contributing anything to the open source community. Rather, then seem to want to just rip off any public domain designs available to them. They’re allowed, but then I wouldn’t bring in the open source argument – and I know a little something about this. In fact, it’s so clear that this is in Behringer’s sights, that it appears the bullet point list above was partly modeled on the spec sheet from the Moog Website. These specs also suggest that Behringer adopted two modifications from the model D reissue for their BEHRINGER D, as well. But I think Uli and company are simultaneously both right and wrong about the official Moog reissue. It’s true that Moog Music are asking US$3749 for their keyboard, and I think it’s fair to say that’s out of the reach of a lot of musicians (and something a lot more would find hard to swallow for this particular synth). In fact, if I had four grand burning a hole in my pocket, I’d be inclined to go after some of the offerings from Moog Music’s own line before this. I just don’t think there’s any comparison necessary. Moog Music’s reissue is a meticulously crafted, American-made instrument complete with keyboard. And Moog’s obsessive compulsive approach to reissues is perhaps partly explained by the contrast with a brand like Behringer. It’s not just about “doctors and lawyers”; it’s also about high-end musicians who want the real thing when they tour. (Yeah, some musicians aren’t starving.) Plus, it’s nice to know the Moog remakes exist just for the sake of them. They’ve gone so far, the originals almost seem slightly inauthentic (just not quite). No, I think the real competition for the BEHRINGER D is in the new synths now available under $500. Apart from everything you can pick up on the used market, which is a lot, you’ve got new instruments like the KORG volca series, Minilogue, and Monologue, the Arturia MiniBrute and MicroBrute, and (more modular-friendly) MakeNoise 0-Coast. Significantly, these are new instruments, too – ones with new character and new sounds to bring to your mix, which simply isn’t true of the now 40-year-old Minimoog (even the original). You can’t pick up a Voyager for $400, but I think it is telling that even Bob Moog thought the Minimoog ought to be reissued with some adaptations and new ideas. I also think it’s a mistake to assume this will take the Eurorack market by storm. That industry seems to be pretty loyal to boutique makers and credible small brands, which is part of the appeal of the whole area. But don’t get me wrong: I do think the BEHRINGER D is likely to be a hit, if it makes it to market at anywhere near $400. Provided they get the sound roughly right, it looks like a practical offering. The trick is if and when it makes it to market. Behringer have so far said this is a prototype, which they’re evaluating for interest. 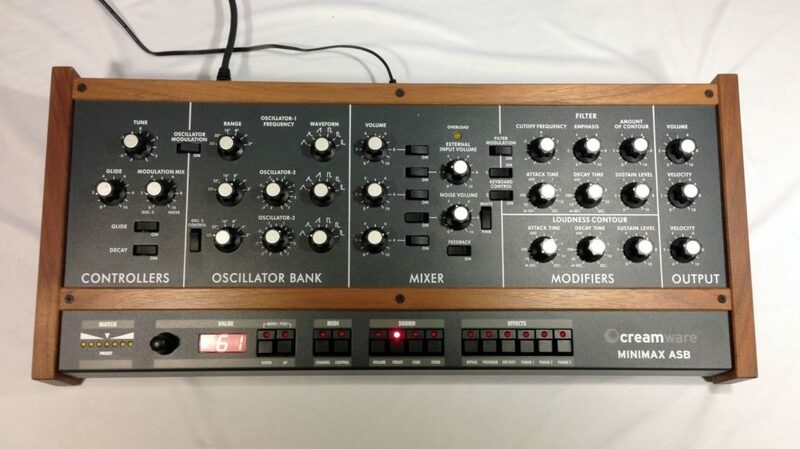 Personally, this looks like a perfectly reasonable desktop clone of the Minimoog, and one that could be a big seller. I just wish Uli Behringer would refrain from making the argument that somehow only Behringer can save starving musicians, and only by reproducing existing designs. I don’t believe that’s true – not when Korg, Arturia, Yamaha, Roland, Teenage Engineering, and many others are making loads of affordable electronic instruments using entirely new designs. And great as the Minimoog was in its day, I think there’s a good argument for looking at the range of synths available.